He was born Guido di Petro in 1395. Little is known of his family and early life. He then became a preaching friar, living in Fiesole on the outskirts of Florence, and taking the religious name Giovanni. A Dominican convent above that city became the place where he perfected the craft of painting — mastering jeweled water pigments and tempera on plaster and wood. He was a contemporary of another master of his day: Gentile da Fabriano. 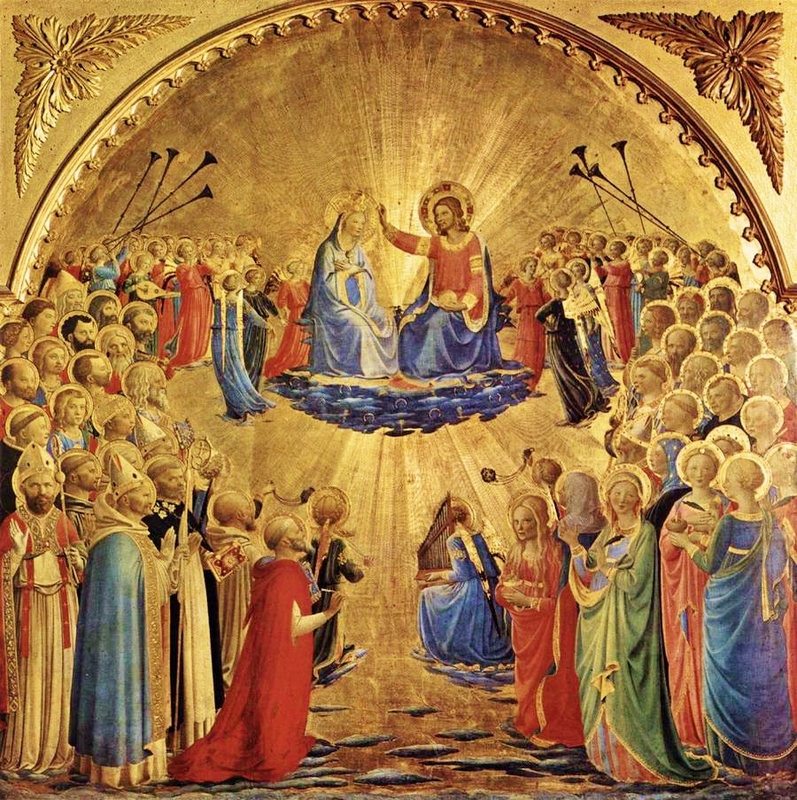 While Giotto and Cimabue and later Ghirlandaio painted the great halls and churches in the hill towns of the Tuscan and Umbrian countryside, Fra Giovanni da Fiesole, who later became known as Beato Fra Angelico, created a cycle of frescoes in the cells of the friar brothers, and priory paintings at the Convento di San Marco at the heart of Florence. He would go on to be commissioned by the Medici family, and later the pope, to paint altarpieces and chapel fresco cycles — works that to this day remain some the Western world’s most glorious exemplars of sacred art. What is it about Beato Angelico that still now captivates us? Is it simply that he seamlessly swayed from the Gothic to the Early Renaissance styles? Is it his technique? The light he infused into his works? Is it the prestige of some of his commissioned pieces, or the delicate ornate maturity of his craft that came with time? While much can be said of the technical nature of the paintings he produced, the struggle is to speak to the integrity of his art. Where was the genius coming from? How did it emerge? What propelled such abundance of grace, such radiance and beauty in his art? Why does it have a mysteriously mystical quality to it? On reflection we see that Beato Angelico painted contemplatively. He worked from the conviction of faith, and so he was able to transmit truths of the faith through his art. The nature of art is to represent the real. He lived imbued in contemplation of the truth, and so transposed the fruits of this contemplative interior life into everything he touched. The genius came forth from the wellspring of a heart devoted to God, and the result were flawlessly executed masterpieces. He put his talent at the service of truth, and it blossomed fully, gloriously. Contemplation does this to a soul — it transforms, uplifts, sustains. Whether capable of painting beatitude as Beato Angelico, or simply of gazing upon it in wonder, the modern soul aches for a sense of the real beyond the actual. In some ways art transcends this gap. Beato Angelico must have understood this, so much so that he devoted all of his works to sacred imagery and divine subjects. He wanted others to receive the joy that comes from gazing upon magnificence and mystery with faith. And this sheer delight was his lasting gift to souls. The clear brilliant light in his works is a reflection of the divine illumination God offers to the soul. Every ray he painted is intentional, every shadow placed to receive the light and be pierced by it. Here technique is at the service of mystery. He used precious pigments to detail the magnificence of the mysteries of the faith. Lapis lazuli, at the time far more costly than gold, was lavished in brilliant blue hues on Marian robes — tribute paid to the Virgin Queen. The saints, the apostles, the angelic choirs are all rendered in forms of stunning serenity, beauty, purity, and heavenly glory. There is a sheer veil in many of his works, symbolic of the mystery at play in the visual rendering of the divine and the real. He did not retouch his works, believing the divine artist to be at work through his hands and not wishing to correct Him. So pure was his faith, so honest the pledge of his talent, and so complete was the offering of his life. He was most kind and sober, keeping himself free from all worldly ties, often saying that he who practised art had need of quiet and to be able to live without cares, and that he who represents the things of Christ should always live with Christ. He was never seen in anger by the friars, which is a great thing, and seems to me almost impossible to believe; and he had a way of admonishing his friends with smiles. To those who sought his works he would answer, that they must content the prior, and then he would not fail. To sum up, this father, who can never be enough praised, was in all his works and words most humble and modest, and in his paintings facile and devout; and the saints whom he painted have more the air and likeness of saints than those of any one else. It was his habit never to retouch or alter any of his paintings, but to leave them as they came the first time, believing, as he said, that such was the will of God. Some say he would never take up his pencil until he had first made supplication, and he never made a crucifix but he was bathed in tears. He who represents the things of Christ, should always live with Christ. Such is the forgotten wisdom of times gone by. Veneration is missing from our work. Contemplation is replaced by communication, so much so that we no longer relish in the gifts of contemplative silence. Days go by without it. And when we find ourselves enveloped in it we are at a loss. We don’t know how to use it, what to do with ourselves. As he painted beatitude, Fra Angelico realized that if he were faithful to his first artistic calling, the contemplative art of prayer, then his temporal art would reflect truth. It was no longer he who painted, but Christ who painted through Him. He turned painting into a means of devotion, transforming the technical into the supernatural with ease and delight. This is the integrity that ordered his life. It is no surprise then, that light and purity permeate his craft, edifying the perfection of his technique, and that the religious feeling of his work is best described as indefinable. We sense the depths of the soul of the artist by gazing on his art; palpable virtue translucent through the detailed gilding and brilliant pigments. This is purity on panels, and an eloquent sermon to love and faith; preaching gone visual. Souls delight in wonder at the patrimony he left us. He used his brush for the salvation of the many. We are the ones now, who gazing on panels laden with azures and gold, receive the choice fruits of his profound faith. The Church honors the angelic friar as the patron of artists. Perhaps we ought look to a master from the cell to understand the urgency of communicating the truth to a resisting modern world. Between the friar’s cell and the universe beyond it is the invitation of Christ Incarnate who begs us to take Him to the places of the world where He is least known and least loved. The modern world needs more souls willing to take on the task of sharing the delight of communion with God. Poverty of the soul abounds as does poverty of the body. Art that renders the visual truth about human dignity and the beatific destiny we are called to is one remedy for them both. It impels the response of faith and sustains its growth when much else fails. That city which is the flower of Etruria bore me, Giovanni. Would that this loyal son of Florence and faithful Friar Preacher bring the many to the throne of grace and mercy, as the splendid fruits of his love for an Incarnate God remain the pulpit of his voice. And may we gaze in contemplating wonder on the heavens he depicts, and make of our lives so lovely, so splendid an offering as he did — until the day when we also can leave our work on earth and delight in the beatitude we are made for, resting there, in the company of the blessed. The feast day of Blessed Fra Angelico is observed on 18 February.